Hi, I’m Jorja Fox and I’d like to tell you tell you about Krissy the elephant. In 1984, Krissy was just two years old, a baby still hugging close to her mother’s side, nestled safe in her extended elephant family and roaming free across miles of African bush. We will never know exactly what happened, but baby Krissy was snatched from the wild wrenched away from her family and home and brought to America. Watch our video about Krissy here and please pass it on to a friend to watch. 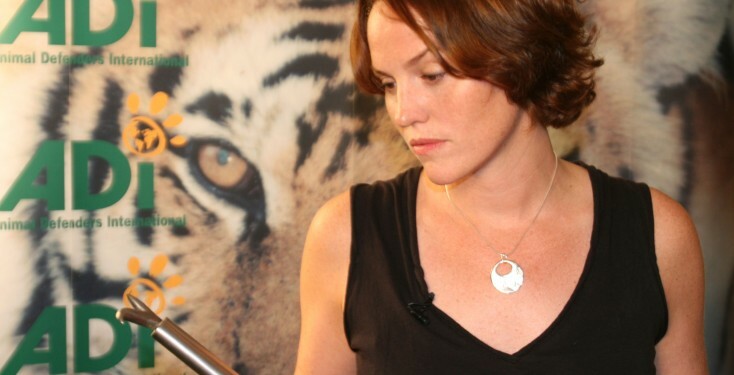 I am proud to have worked with Animal Defenders International for several years, witnessing their incredible rescues first hand – like Operation Lion Ark when they closed down every circus in Bolivia and airlifted 25 rescued lions to safety in Colorado. I’ve also taken part in their amazing initiatives such as the launch of H.R. 3359, The Traveling Exotic Animal Protection Act, in Congress. These are tough times economically, so ADI really needs your help. Please help ensure ADI continues to save animals, educate and change the world for animals. Together we can end the suffering of animals like Krissy. Please send a donation today.